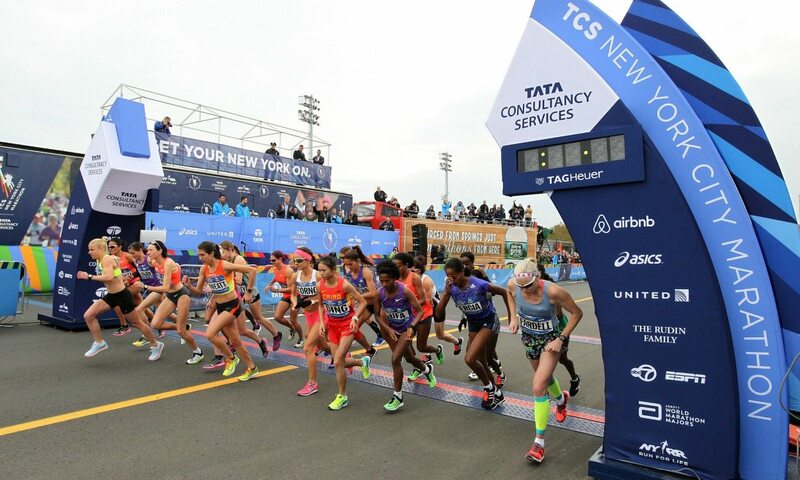 You can surely hardly have failed to notice, unless you exist in blinkered, ignorant bliss in terms of a major branch of our sport – the autumn marathon season is in full swing, with 26.2-mile races like Berlin, Chicago, Amsterdam, Toronto, Frankfurt, Cape Town, Cologne, New York and Fukuoka, just to name a few of the monstrous global gatherings, each providing a massive payday to numerous elite athletes, a precious fund-raising opportunity for thousands of charities, and a unique chance to be proud for tens of thousands of sub-elite runners, joggers and even walkers. In short, marathons improve lives, millions of them. While not solely responsible, the elite athletes are often a major factor as to why there is any TV coverage. It’s their astonishing fitness, world-class racing prowess and sheer guts under pressure that make riveting viewing one weekend after another. Their battles for supremacy are entertaining – show business in fact – and it’s elite sport, one we can all relate to, at least to some degree, and that is what justifies the TV spend and enables the sponsorship dollars to pour in to the event. Sponsor access to an audience or even the database of tens of thousands of targeted ABC consumers doesn’t hurt either, naturally. But there are two big issues in the sport of road racing right now. One is whether to have those elite races “set up” by pacemakers or not. In effect, what is the most entertaining format for spectators and viewers? The other is how we begin to rebuild mass media interest in the sport on a weekly basis. If a race is paced, it is usually faster than it otherwise would have been, but the actual “racers” are often not required to make any full effort and “thought” themselves until at least 60-70% of the race is done. So the window of “racing” can be as short as the last 30-40 minutes and the current debate is whether more races should do away with pacemakers and make that racing “window” open as soon as the starting gun sounds. Boston, the oldest and most iconic marathon in the world, has never had them and New York, the world’s biggest marathon, successfully joined them with that philosophy a few years ago. Chicago, one of the four unofficial “world record courses” on the circuit (the others being London, Rotterdam and Berlin) tried it recently for the second year, and generally liked the resulting racing. The Olympic Games obviously has no pacemakers and neither of course does any championship race. Generally, championship marathons, with medals, national colours and team contests to follow, are more engaging for the viewer, with a built-in “caring factor” for much of the audience. But it’s some of the big commercial races which are re-assessing their approach. In truth, I think both can work and there is no fixed rule. Boston and New York have dynamic, challenging courses, so there is plenty of incident without pacers. By contrast, Chicago is flat, fast and relatively featureless, yet their unpaced men’s race on October 9 was a fascinating unfolding of surges, bunching, suicidal accelerations and sinuous weaving across the road. It was fabulous entertainment, yet last year the same unpaced format was a bit of a damp squib. Chicago race director Carey Pinkowski wants to get back to the core of the sport – to racing – and away from what he’s come to view as over-choreographed paced processions where conditions favour metronomic running ability rather than the full gamut of being fit, being able to think on your feet and make the right decisions, with unpredictability being the keyword. With my TV commentator’s hat on, I have a lot of sympathy for that perspective. In contrast, Berlin two weeks earlier on September 25, was a dream come true for its race director, Mark Milde. Used to witnessing world records set up by a pack of pacemakers, his event hosted one of the great clashes of the modern era, as Kenenisa Bekele eased away from Wilson Kipsang over the final two kilometres to miss the world record by just six seconds. It was a rarity, all the more wondrous as both men were considered to be perhaps past their best. Should we care about whether a race produces fast times or not, as long as the racing we witness is top drawer? It’s a more pertinent question in regard to marathons, as that first 90 minutes of a paced race can be pretty “uneventful” if all goes to plan, so to speak. For example, several pacemakers clip off the first 25-30km at a significantly quick tempo, step aside and let the heavyweights duel it out. In a track 10,000m we can wait patiently for 20-25 minutes, for that burst from the pack, the surges and feints, before Mo Farah or AN Other, tears through the final lap to glory. Finish times are not important. Who cares about his time in that Rio 10,000m? He dominated those 25 laps of tension before the crescendo which was worth waiting for. I’ve a feeling that Berlin and maybe London, for different reasons, are probably the only two cities which can provide the right mix of conditions for any world record to be broken now. Berlin is super-flat, and provides good pacemakers and large crowds, while London has a handy drop soon after the start, is flat enough, can buy the best marathon fields possible and has probably the biggest crowds of any road race. The result is a heady mix which enables London to tick most boxes, most years, producing fast times, great racing and wonderful spectacle. The incessant demand for fast times is hard to meet, but unfortunately we’ve been taught to believe that a marathon race should be judged principally by its winning time, not by its racing. Time rankings carry huge significance for shoe company contracts and bonuses, sometimes for team selections (Ethiopia, take note) and for giving a race a perceived status against its rivals. There’s also an unwritten acknowledgement in the industry that fast winning times mean a good event, and yet that’s a poor indicator. What the sport really needs of course, is an athlete road ranking system akin to tennis or golf, which could be updated weekly. The various point-earning criteria could be debated of course, but the principle that the media be given a straightforward ranking is undeniably logical. Athletes would achieve a ranking according to points accrued by the calibre of athletes beaten in a race, from a specified list of races. The worth or merit of any race, would depend on the athletes who line up and compete, not on the times they end up running. For argument’s sake, the world’s top 500 men and 300 women (because the men’s side of the sport has much greater strength in depth) could be ranked from January 1 to December 31, each accumulating points according to their best 10km, half-marathon and marathon. The result would be a “road racer of the year” – possibly a more logical and accessible title than World Marathon Majors champion, behind which is hidden a complex and far-from-perfect scoring system, which takes no account of the strength of the field at each WMM event. The vast majority of elite marathon runners will race the occasional road 10km and half-marathon, so all this idea is asking them to do is to choose at least one race of each distance and target it as best they can. Agree with this or not, the fact is that road racing is huge, but doesn’t get the media coverage it deserves and something has to give. On the Daily Telegraph website, athletics is buried between archery and badminton and that was a paper which used to have a full-time athletics correspondent. Road racing is one branch of the sport which is thriving and yet remains non-mainstream among most media – and it’s high time that changed.